The buzz has started. The excitement is building. It’s all about the annual sabbatical that over 10,000 planes and pilots make to Oshkosh every year in July. And, of course, there’s the other 450,000 or so who make the trek by other means–commercial airliner, camper, cars and just about any other mode of transportation that you can think of. You are probably thinking “boats”. My guess is that a few of those motor into Brennand Seaplane Base for the annual event. by “Antique Flash” Patty-Trish Dorlac Led by our maintenance chairman, Michael Blombach, co-chairmen, Wayne Wendorf and Al Hallett, and chairman emeriti, Bob Brauer and Bob Lumley, an incredible hard-working group of volunteers accomplish what seems miraculous for “build it in a weekend” projects! Every year a dedicated group of about 30 Vintage Volunteers converge upon Oshkosh-in all weather-to build and repair all the buildings in the Vintage area. This eager, hard-working group puts in long hours to accomplish the goals that are set for each work weekend. Many people are replacing HD flat screen TVs with newer 4K models. Vintage is moving into the digital age for AirVenture and can make good use of your old HD flat screen TV.Rather than printing thousands of Daily Events Schedules and other information, we hope to have digital monitors strategically located through our two-mile AirVenture area. Our primary information sites will be in the Red Barn at Rose Plaza and in Tall Pines Cafe. We are looking for TVs 32″ or larger. Only requirement is that they work and have an HDMI connection. The more TVs we get, the more places we can display this important information.Contact Hannah at 920-426-6110 if you can help out.. This is a repeat from our last issue. The AirVenture 2017 NOTAM, will be in effect from 6 a.m. CDT on Friday, July 21, until noon CDT on July 31, and outlines procedures for the many types of aircraft that fly to Oshkosh for the event, as well as aircraft that land at nearby airports. The NOTAM was designed by the FAA to assist pilots in their EAA AirVenture flight planning. 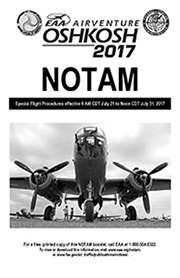 This year’s NOTAM cover features a photo of a B-25 bomber parked at Oshkosh during the fly-in. While the overall procedure is similar to past years, there are some changes compared to the 2016 version. A Pilot You Should Know: Chris Thomsenby Connor Madison, VAA 724383Meet Chris Thomsen, EAA #405924 #VAA 722833, and his 1947 Cessna 195, N4331N. Chris and I connecting, in my mind, is a pure experience that is what Vintage does for all of us.I sat down with Chris to interview him having only known him from the handful of emails we had exchanged. We quickly got into an awesome conversation about not just his history with 31N, but about flying, our favorite AirVenture experiences and life in general. What felt like 20 minutes was actually two hours! I know all of you have had many similar experiences so I will apologize in advance for the following story being much shorter than it could be. The amazing Columbia compiled an enviable record of long distance flights in just a few years and could easily have won the New York to Paris $25,000.00 Orteig prize. It was only the questionable decisions that preceded the flight that prevented the Columbia from winning the prize and capturing the fame, fortune and world-wide recognition that Charles Lindbergh achieved.In 1926 Bellanca joined the Wright Aeronautical Corp. as a consultant. 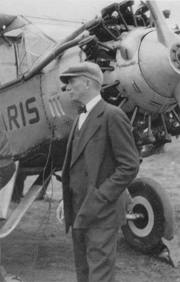 While there he designed two aircraft, the WB-1 and WB-2, which later was named the Columbia. It was here that Bellanca and Clarence Chamberlin developed a close relationship.Unfortunately for the two, the Wright organization decided to concentrate only on engine manufacturing, so Bellanca and investor Charles Levine established the Columbia Aircraft Co. One of their early achievements was on April 12, 1927 when Clarence Chamberlin and Bert Acosta took off in the WB-2 and stayed aloft for 54 hours and 30 minutes flying an estimated 4,100 miles–a record endurance flight!